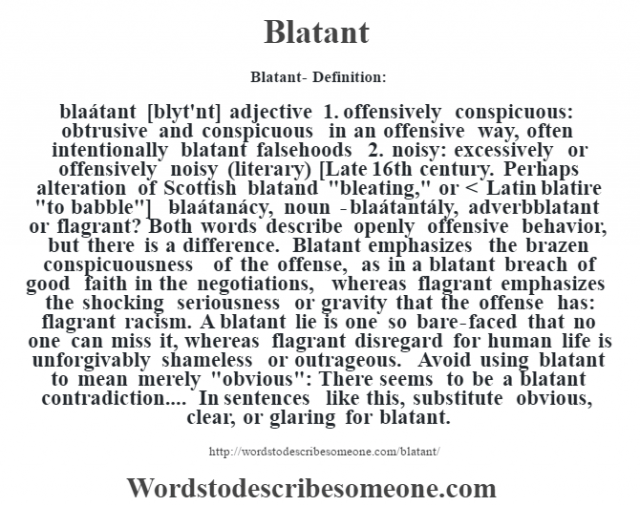 blaátant [blyt’nt] adjective 1. offensively conspicuous: obtrusive and conspicuous in an offensive way, often intentionally blatant falsehoods 2. noisy: excessively or offensively noisy (literary) [Late 16th century. Perhaps alteration of Scottish blatand “bleating,” or < Latin blatire "to babble"] -blaátanácy, noun -blaátantály, adverbblatant or flagrant? Both words describe openly offensive behavior, but there is a difference. Blatant emphasizes the brazen conspicuousness of the offense, as in a blatant breach of good faith in the negotiations, whereas flagrant emphasizes the shocking seriousness or gravity that the offense has: flagrant racism. A blatant lie is one so bare-faced that no one can miss it, whereas flagrant disregard for human life is unforgivably shameless or outrageous. Avoid using blatant to mean merely "obvious": There seems to be a blatant contradiction.... In sentences like this, substitute obvious, clear, or glaring for blatant.